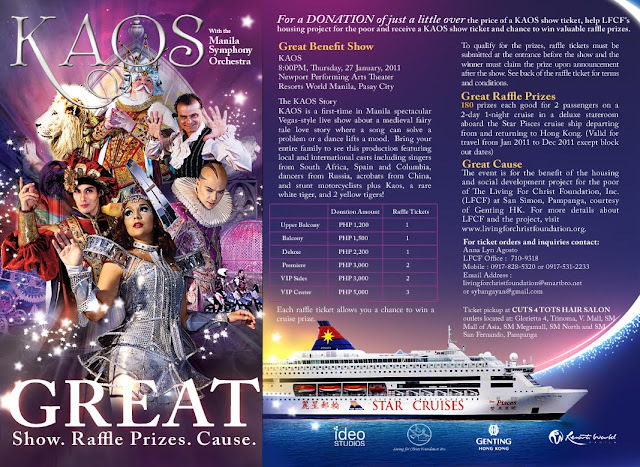 manila fashion observer: Watch Kaos, Win a Prize and Help Build Homes! Watch Kaos, Win a Prize and Help Build Homes! You still have time to buy tickets! On January 27, 2011, enjoy KAOS, get a chance to win a cruise package and help a worthy cause! Living for Christ Foundation (LFCF), is a non-profit organization that builds homes and grows self-reliant communities for the poor. Right now they are raising funds for their current project in San Simon, Pampanga. They are currently developing a ten hectare property along the main highway, Quezon Road, to house 800 families with provision of multi purpose and training centers, admin and coop offices, etc. Phase 1 on 2.5 hectares is almost completed with 200 houses. They are now starting development of another 4.5 hectares to build 450 houses. 12 cruise packages (good for two) departing from Singapore, Malaysia, and Taiwan. That's a 193 cruise packages to be raffled off! Total proceeds for the production on January 27, Thursday will be entirely given to LFCF.